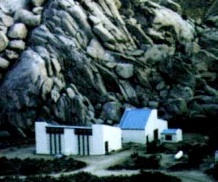 The first year, we stayed at the UC Granite Mountain Reserve in the center of the Mojave Desert. The Granite Mountain Reserve has a bunk house and kitchen, although many slept under the stars. Day trips ranged throughout the Granite Mts., into the Providence Mts., and over to Kelso Dunes. While it had been dry that year, both the bryophytes and flowering plants were a diverse and unusual sight for coastal Californians. Comet Hyakutake was at perigee (one of the brightest comets of this century). 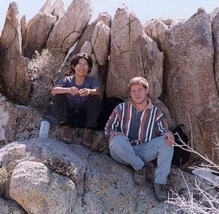 Patricia Sánchez-Baracaldo and John McMurray catching a bit of shade at the Granite Mountain Reserve.